My husband and my daughter. She's 7 now, but was only 4 in the picture. He's an amazing martial artist. He's a 4th Degree Black Belt in American Kenpo and a 3rd Degree in Kyusho Jitsu. 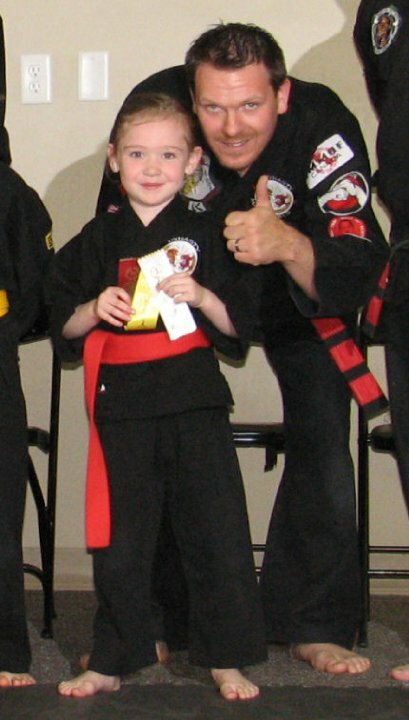 He still has lots to learn, but what makes him amazing is that I truly believe he upholds what a true black belt is. He's not cocky or flashy. He's humble and has such a passion for teaching. Here's a short clip of some Small Circle Jiu Jitsu wrist locks.